Apparently, I blinked and it’s now October! And not even just October, a good week into it. How did that happen? 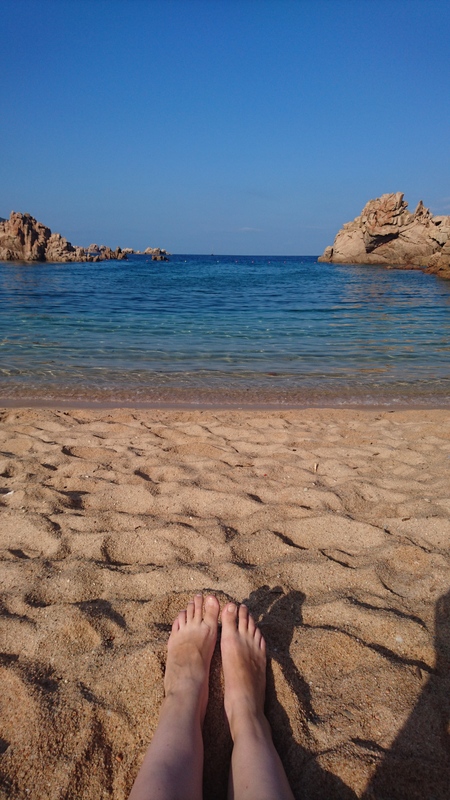 One minute, I was dreading the summer (okay, maybe dread is a bit too strong a sentiment, but I was definitely apprehensive about it); the next, the summer has flown past in a Sardinian sun-drenched daze. Festival over the first weekend in September, which was just magical (to use one of my father-in-law’s phrases). 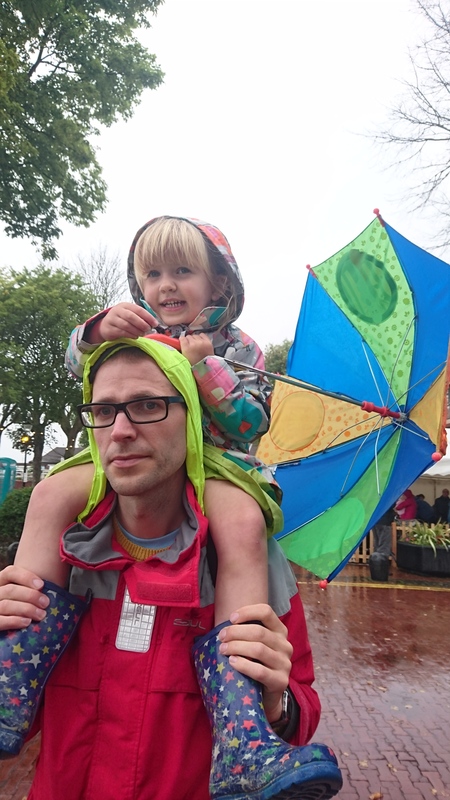 Despite a very, VERY, soggy start to the weekend, it was a brill couple of days. Interesting things to see, great music courtesy of British Sea Power and the kids loved it. I did intend to write a full, proper review of the whole weekend but I just didn’t have time. The week after we were there, we were flying off to Sardinia. So there was no time for blogging, it was full steam ahead on washing and packing. Sardinia was amazing. We stayed in a small apartment on the Costa Paradiso resort. We were a little bit concerned before we went, to say the least… three weeks before we were supposed to fly out, we’d received an email from our accommodation owners saying that the surrounding landscape had all been burnt in a forest fire. So, we had to quickly find somewhere else to stay. Slightly stressful! We found this apartment, but we were apprehensive about staying in what was billed as a tourist resort. However, our fears were unfounded as the Costa Paradiso area is lovely. Lots of weird rock formations creating an interesting and gorgeous backdrop to the holiday houses, which had been well incorporated into the hillside. The nearby beach, the Spiaggi Li Cossi, was just beautiful. We went there for four days out of the seven, and none of us got bored of the walk across the cliffs to get to the beach. 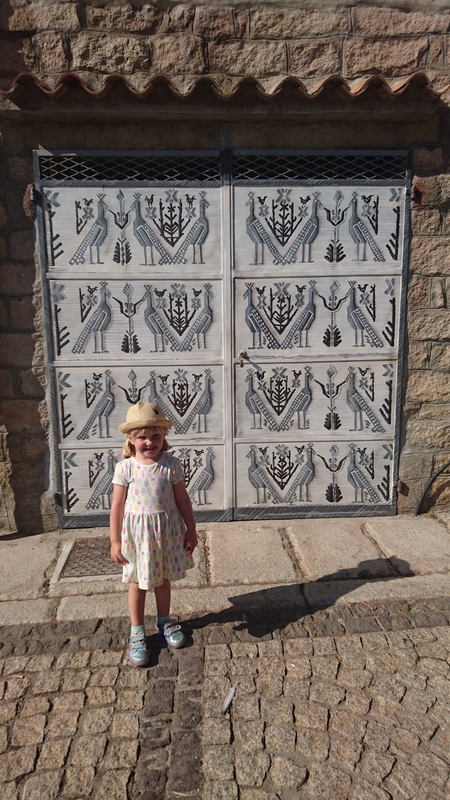 We spent most of our week there visiting a beach in the morning and looking round an old town in the afternoon. If you follow me on Instagram (@littleowlski) then you’ll have seen some of the pictures I took of the beautiful scenery there. My photography skills can’t do it justice! As always, after a family holiday, I come away feeling really relaxed and rejuvenated. I don’t know why, because I read online all the time about how family holidays are stressful and everyone is exhausted by the time they get home. Not me! Probably because I’m happy to laze on the beach a bit while the kids paddle and play nearby. Other than our big holidays, we’ve spent much of the holidays doing crafts, playing in the garden and visiting the local parks. Corliss properly learned to ride her back this summer, so she’s absolutely loving whizzing around everywhere on her bike. 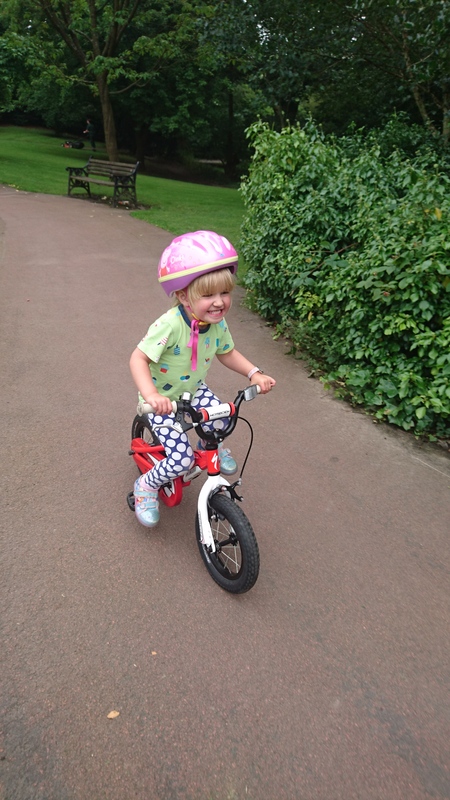 Well, I say whizzing around… there’s very often a reason why she can’t cycle a particular bit. I.e., it’s too steep, it’s going downhill, it’s near a road (that’s miles away). But, she is getting more confident and she looks pretty cute on her bike. She’s so tiny to be riding a bike! Dexter is getting better with his concentration levels now so we can do a bit more with him. He’s getting better at crafts too, so I can set things up for them both to play with now, confident that he might actually have a go too. 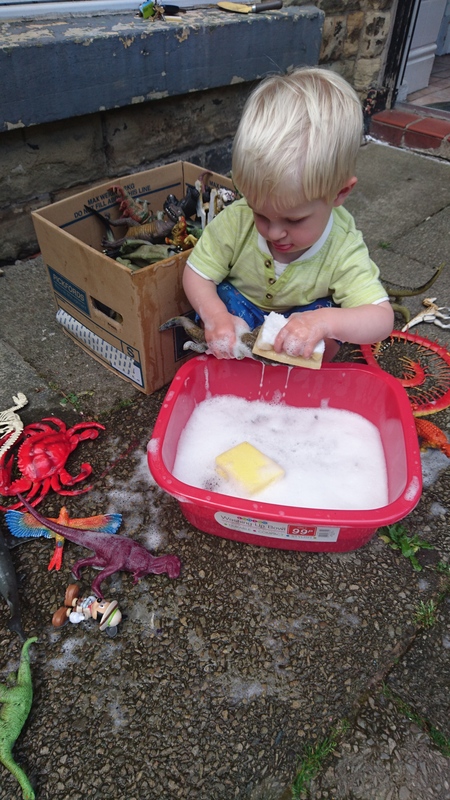 I bought a load of old plastic animals from a car boot sale (thought they were Schleich ones, got mega excited, bought them for top dollar, turns out they’re not Schleich…) and Dex had great fun washing them outside. I love how his little tongue pops out when he’s concentrating! 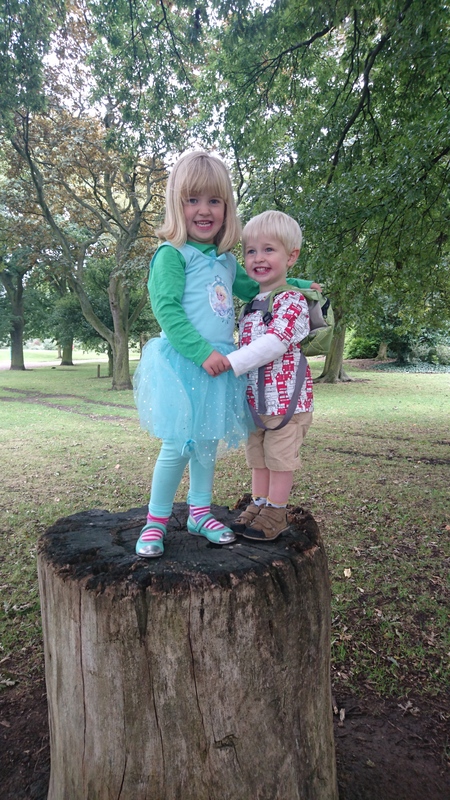 Dinosaur World went down very well with them both, particularly Corliss! So Summer was lovely. And now it’s October and my mind has turned to indoor things – keeping warm, getting the fire on, lighting candles, setting up indoor crafts, baking, making soups and stews. 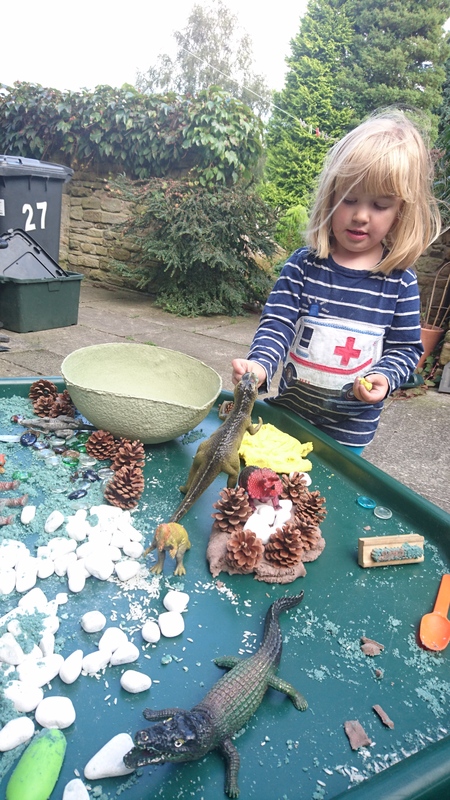 Corliss is in her final year of pre-school, which she still loves, loves, loves beyond anything else and we need to start thinking about primary school applications. Dexter is chattering away now, trying to copy pretty much anything you say. I feel like the difficult baby stage is just about gone. These guys are becoming pretty good friends, despite a few tussles over various toys and Corliss not understanding that Dexter doesn’t want to be bossed about all of the time! I’m looking forward to the next part of the year the most; I love Halloween, Bonfire Night and now it’s the kids’ birthdays coming up too. Despite the dark nights, it’s a fun time of year. Best get on with it!